I just love my readers. You all are wonderful! I received the most interesting comments to my last post regarding my recent production here in Geneva. The comments were thought provoking, passionate, well-thought out, varied, insightful, and intensely personal - all the things that opera tends to stir up in people, and one of the reasons I LOVE being a part of such a crazy world. One person wouldn't be caught dead at a production like this, and the next finds it one of the most moving, memorable nights ever in the theater. The only thing I ask of an audience member is to try to come with some semblance of an open mind. I ask that of myself, as well, because it's very easy to assume I know everything about an opera or particular character, or that, at first glance, a production may seem unreasonable or far-fetched. However, if I can remain open (mind you, I'm not speaking about being without opinion or easily brain washed), but simply OPEN - then I just might stumble upon something truly wonderful. Same for the audience. It's not an easy prospect, which is why it is, in my most humble of opinions, the highest of the arts - but we must keep searching and trying! But seriously, thank you for letting me express some ideas, and for your wonderful responses! I have truly enjoyed this production of "La Donna del Lago" and learned a tremendous amount from it, and I appreciate being given the chance to try something new and inventive. This keeps me alive as an artist. But I want to lighten it up a bit now - even if I'm a bit behind in the timing. 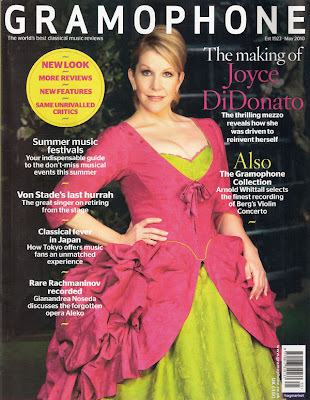 But some of you may have seen the cover of Gramophone for the month of May? (It should still be in your book stores for the time being.) I was lucky enough to be the cover girl, and had an absolute ball during the photo shoot. This is an element of the career that is a total blast for me - getting made up, being fussed over (which normally drives me crazy!) and playing in front of the camera for hours at a time. It's definitely not a skill that is taught in the conservatories, but rather something that you try to acquire (usually awkwardly, or at least that was my case!) over the years. It is another universe from singing on the stage, but with the right group around you, it can actually be a lot of fun. I couldn't have been happier, because it is, truly, my favorite costume of all time. It's slightly period, with that fabulous lace-up corset, but bold and brash with it's vivid colors, not to mention infinitely "girlie" with the numerous pink touches. I'll never forget that the brilliant costume designer, Agostino Cavalca, spent so much time in the early weeks of our rehearsals to see how I moved and how he might create a costume that was most organic to me as a performer singing Rosina. He succeeded brilliantly, and has spoiled me for all other productions. For example, the fluffy pink "over-coat" that fits over the base green dress is meant to mimic the petals of a rose - driving home the "Rosina" element over and over. It was such a joy to wear, and OH did it feel great to be STANDING in the costume once again! One can never, ever underestimate how important a costume is to a performer. It is an enormous element to the character development of a role, and one that cannot be overstated. I have worn beautiful costumes and horrid costumes, and I have worn ones which enhanced immeasurably my sense of character on the stage and ones which have obliterated my sense of self-esteem, directly affecting my performance in a negative way. It is not an easy job, but it is SUCH a vital part of what we do. I have learned to be less passive in regards to the development of a costume, and cannot fault the ladies who have come before me, fighting, sometimes famously, for their say in what they wear. There is a fine line, and balance - as always - is key, but I have learned that it is a far too important part of what I do to let it go for naught. I will MISS this costume!! And then we just had some fun - our wonderful photographer was rushing to catch a flight, so we just let loose and had a bit of fun. I won't lie - this is definitely one of the fun perks of my job! Thanks to the tireless Magda Krance for the fun, behind-the-scenes shots, including capturing my husband unawares!! On another note, and speaking of fun "perks" - I get to meet some of the most astonishing, spectacular, talented, generous and most wonderful people in the world, doing what I do. One of them happens to be the (and yeah, I'm dropping names here!) the international best seller, and unabashed Handel Junkie, Donna Leon. If you never travel in airports or visit bookstores, you might not have seen her name - but if you have, surely you'll recognize her as one of the best selling mystery writers of our day. She has a delightful series going on with Detective Brunetti, set in her hometown of Venice, and the wicked and wacky circle of the inner world of crime and deceit is deliciously portrayed - not to mention tantalizing descriptions of the local cuisine in nearly every chapter! Well, my proudest claim to fame is that her latest book, "A Question of Belief", happens to be dedicated to....me!! I was flabbergasted when she sent me the first manuscript with the inscription, "For Joyce DiDonato", and even more astonished to receive a copy in hard print!! It's a delightful read, and I, naturally, encourage you to go out and purchase one for everyone on your Christmas shopping list! I'm proud to be able to say that you would be supporting an author who is single-handedly, one of the biggest and most generous supporters of the arts I have ever met. Granted - she limits her benevolence to All Things Handel, but you can imagine that this is just fine with me! She's a true renegade! 2 more shows here in Geneva, which I'm very much looking forward to, and then it's off to Paris to start rehearsals for another new production of this masterpiece. But if you had to miss out on this performance, or can't make it to Paris, happily there will be a radio broadcast on JUNE 12 at 20:00 (European Time) on Radio Swiss Romande, Espace 2. I'm very proud of the work we've done here in Geneva and hope it will transmit as such over the radio!!! In the meantime, can someone PLEASE do something about all this rain? Merçi, mille fois! Thats so exciting! She dedicated her book to you! I hope you have a wonderful time in Paris. It's raining everywhere today! We tried to listen to the Internet broadcast yesterday,but, alas, there seemed to be a problem and they had a concert from Berlin instead. So,we'll have to wait until July 12th and catch it on the BBC Radio 3, but my calendar is already marked! What a gimmick. Setting novels in Venice. Doesn't exactly keep the tourists...I mean readers...away. And she mixes in all sorts of operatic stuff which certainly doesn't hurt for people who read this blog. In this light the dedication is hardly surprising and most appropriate. I think you're absolutely right about the costumes though. They can make a huge difference and this Rosina get up is certainly up there with the best I've seen. The opposite can also be true and the costume is often contrived in such a way, seemingly on purpose, as to be particularly unflattering for the singer and distracting, confusing or irrelevant to the story. I'm glad you're enjoying the LDDL in Geneva and I'm sure those lucky enough to see it have as well. Can't wait for Paris next month. I do hope the weather clears. That fountain is especially compelling on sunny days. In the mean time, your costume as 'Rosina' in London's 'Barbiere' is literally the happiest costume I've ever seen. 'Hooray!' for wearing it again and for the cover of 'Gramophone'. All the best for Paris! Keep us posted! Having purchased the magazine, I can say that the photos are amazing! And what you said about a new solo recording is also very interesting... can't wait! Enjoy your day, and see you tonight! Thank you Joyce for the new post. Photos are great, and nice that somebody dedicated a book for You. I agree with You, very important that you should go to the opera (or theatre) to be open, open for new things as well. Will get my tickets to Salzburg hopefully. Im looking forward very much to see you, with the legendary, and my other favourite Gruberova. Norma is a such a wonderful music, and Adalgisa is a perfect role for You. I second Rocio: it is amazing, how you manage to interact with us, in light of your schedule, and it is so much appreciated! The postman today delivered my ticket for Usher Hall in August, so if our favourite volcano does not get into the way I will see you there. You look extra-cute in this dress and the photos are fabulous. Thanks for sharing! Magazine is a must-buy..
PS Hope you know the story about Beverly Sills cutting up her Scala costume ONSTAGE after asking wardrobe for a color change umpteen times - the cast APPLAUDED her! 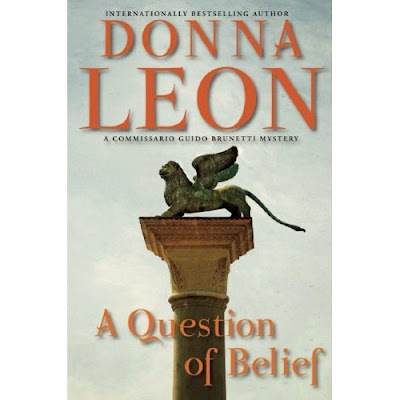 Ohhhh, what a joy to be the dedicatee of a new Donna Leon novel! (I love that series.) Congratulations. And the pics with the Rosina costume make me smile! Thanks for posting them. Completely agree about costume either making or very much marring a performance. The plea for an open mind is totally key: thanks for bringing that up. I worked in Shakespearean theater for ages, and you really have to be willing to let go your preconceived notions (Hamlet set in Pinochet's Chile? Why not!). As a former costumer, I appreciate your understanding of what a costumer can contribute despite sometimes conflicting requirements, so thanks for that. I also love Brunetti!, so I eagerly await her latest with its dedication to you! You so rock! There is a video from 14. May. performance from Geneva of La donna del lago on youtube. Joyce you are fantastic, this is amazing singing! I'm unfortunately not likely to ever see the Genève production. Even so, I enjoyed and appreciated your description of "our little humble production" and I'm sure it would have helped if I was going to see it. I think it may help me see the Paris production since it's an opera I'm unfamiliar with. I hope you'll give a little insight into the Paris production as well. If I go to a production I believe I have an open mind but I check who's in the production team and there are some individuals that would make me not bother with a production. Two swallows just landed on a line outside my window in Stockholm. Summer is here. One thing that can destroy an otherwise good production for me is when there are a lot of side activities that takes focus away from the singers, Ariadne at the Met being one of these. On the other end of the scale was Lulu at the Met, focused and well sung and acted. Four hours well spent. gramophone.co.uk offers free access to the first 20 pages of the May edition for those who do not have easy access to the magazine. I too dislike booing, but for some it is a way of getting their view upfront and center. Unfortunately we live in a world today where manners are often lacking. I agree that silence is the appropriate role, even if I am inwardly booing. I tend to get very nervous at opera productions that rely on tables and chairs for scenery. I attended the recent "Tristan" at Covent Garden, and at least a third of the audience could not see the action on stage during much of the opera. The director placed Tristan and Isolde to the far side of the stage, sitting at a table placed against a wall. No matter how far those sittting on that side leaned out, they could not see anything. There was booing at the end for the director...even at usually sedate Covent Garden. Instead of booing, I wrote the manager and complained. There was no reply. Perhaps in sum, the fact that many ads for opera today put the conductor and director in bold type, but one has to scramble to find out who is SINGING. I think that tells us something. In the meantime, have a great time, about which we all, as usual, hope and expect to read. Ah, yes the booing!In Handel's days it was taken in stride. Both Cuzzoni and Faustina, big rival stars on the stage,endured hissing, hollering and hooting, often by paid claques.And there was drinking in the audience, clearly opera then was entertainment for the common people.BTW-if you haven't seen our hostess'Cuzzoni skit-find it-it's a delightful little piece of film-making.But what of today? Well, for one , there is Mr. Slatkin getting his ears pinned back at the Met, apparently unprepared to conduct La Traviate on short notice.And a well-known soprano got boo-ed roundly at La Scala by the loggione.To her credit she gave them all a big smile as she walked off. What she gave them once out of sight was not revealed.From the Geneve Tribune:Heroine of the heart, what a musician, what an actress!Ms. DiDonato"s vocal and artistic sensibilities are at the top.Her Elena, quivering with the desires of youth had the bearing of a queen.Well, somebody had to mention it. Bon voyage! The London Barbiere arrived today and I just finished watching it. It's FANTASTIC! The "per la scala del balcone" part is just priceless! Thank you Joyce, to you and the cast (the singers I mean!) for being so awesome and for putting on this absolutely delicious performance! I highly recommend it to anyone who hasn't seen it yet.